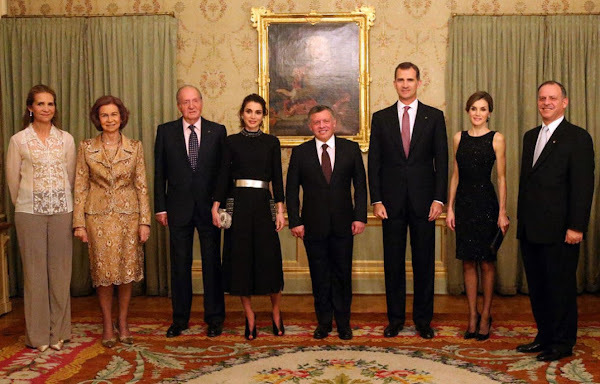 Spanish King Felipe VI and Queen Letizia hosted a dinner banquet in in the Palace of El Pardo on Thursday in honour of King Abdullah II of Jordan and Queen Rania on the first day of his working visit to Spain. Prince Feisal, King Juan Carlos, Queen Sofia and Infanta Elena, the Duchess of Lugo, also attended the banquet. 19 November 2015. 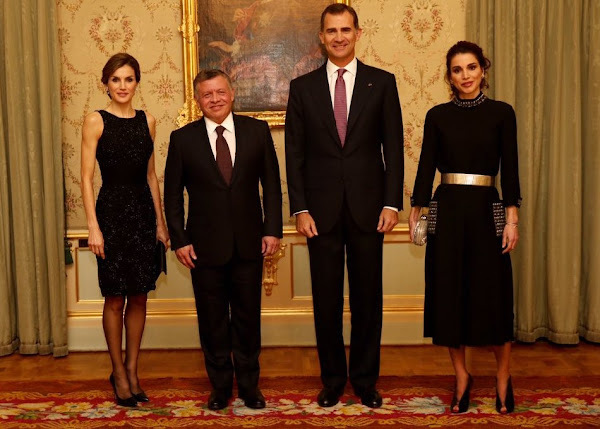 Queen rania stands in a weird posture.....and I dont think this dress is perfect for this dinner... May b a long Jordanian gown or ONE similar to queen letizia would have been great. This is my opinion... What about others????? I'm not a fan of Rania's Dress either, but it's still light years better than Infanta Elena's outfit. As for the weird posture, I'm sure she isn't feeling well in these shoes. She looks as if her feet are hurting. If I had a tiny husband like her, I'd wear nothing else but ballerinas. Queen rania looks odd. Though she is a beautiful woman. Don't know what she is wearing those two days. Dislike big time. the last weeks Rania wear ugly cloths. La reine Rania est d'une beauté fascinante. 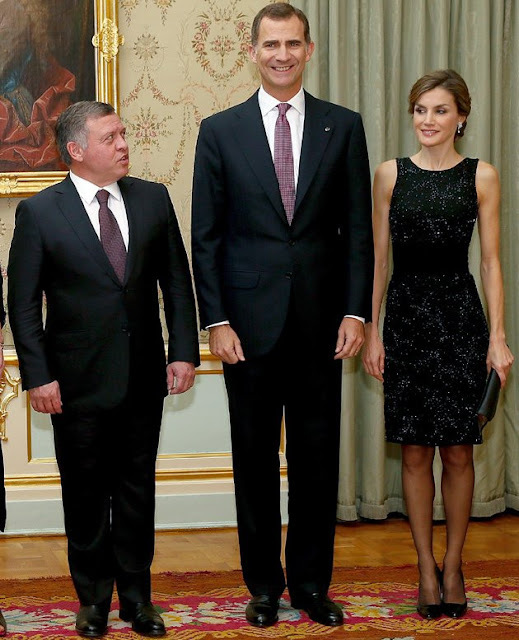 To me this is just a positure, not really weird and I find Queen Rania's dress is right for the banquet. What I'm wondering about is why Queen Letizia always choose to show her very skinny arms ! But very beautiful Queens … whatever they are wearing. Letizia, toujours sobre, belle et lumineuse. Who is Mett Marite ???? If you mean Mette-Marit, she has no style at all.